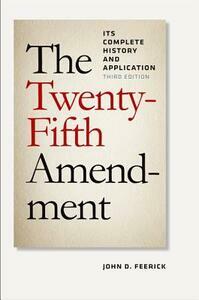 This new edition of The Twenty-Fifth Amendment: Its Complete History and Applications updates John Feerick's landmark study with the Amendment's uses in the past twenty years and how those uses (along with new legal scholarship) have changed the Amendment and perceptions of presidential disability in general. In its formulation, the Twenty-fifth Amendment was criticized as vague and undemocratic, but it has made possible swift and orderly successions to the highest offices in the U.S. government during some of the most extraordinary events in American history. The extent of its authority has been tested over the years: During the Watergate crisis, it was proposed that the Amendment might afford a means by which a president could transfer presidential power during an impeachment proceeding, and it was also suggested that the Amendment could authorize a vice president and cabinet to suspend a president during a Senate impeachment trial. Where once presidential disability was stigmatized, today a president under general anesthesia cedes presidential authority for the length of the procedure with little controversy. The Twenty-fifth Amendment is evolving rapidly, and this book is an invaluable guide for legal scholars, government decision makers, historians, political scientists, teachers, and students studying the nation's highest offices.